Durant (ankle) will return for Monday's game against the Spurs, Mark Medina of The Mercury News reports. Durant missed two games with a bruised right ankle, but he'll be back in the mix Monday and will reclaim the starting small forward spot. 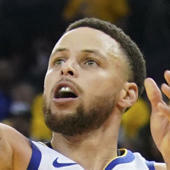 Golden State had no trouble dispatching both Houston and Oklahoma City in Durant's absence, and he'll return as the team begins a five-game week.